Britepaths' Artful Living event on the evening of Thursday, May 2, is one of our two signature annual community events. 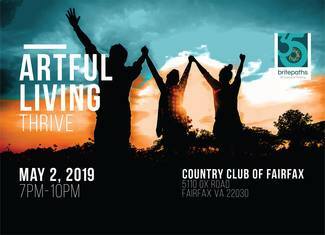 Your volunteer support before, during and after the event will help make the evening a success, and play an important role in our work to help our Fairfax County area neighbors who are struggling move from a place of need to true financial self-sufficiency. There are many ways to help. Volunteers must be 16 years and older. ****NOTE: There is a MANDATORY Volunteer Training on Saturday, April 27th at 10 am. We will send out additional instructions for volunteers who have signed up for assignments in the days leading up to the event. Please note that we are requesting that volunteers enter a contact phone number. We will use this information solely for a point of contact on the day of the event in case something changes or we need to convey urgent information. Duties include set-up easels, placing art on display, greeting artists and accepting art work. Out of town on April 27; let me know if this position requires the mandatory training. Not available for training on 4/27 but can arrange to do another time. Guests will vote on their favorite art work. Set up People's Choice Award table and provide guests with ballots and information about voting. Greet guests as they arrive and assist them with registration or check-in. Must be comfortable with using the computer and square to collect payments. Training is REQUIRED for this position. Must be 21 or older. i have volunteered at this event before, will do my best to be at training on 4/27. I greeted guests last year. I’m so sorry i am out of town on the 27 for training. Collect payments for art purchases and live auction items. Also assist art runners with collecting art pieces for purchase. I cannot attend training, but I will be at the event the whole time. Guests will vote on their favorite art work. Provide guests with ballots and information about voting, tally ballots, help hand out award, and clean up table after award is made. I will be at the mandatory training on the 25th. All art in the show is for sale! Help facilitate sales by helping purchasers mark art as sold, retrieving art for purchasers, helping clean up at end of show, including helping load cars, etc. If you need me at training for another position please let me know.